March 2004. 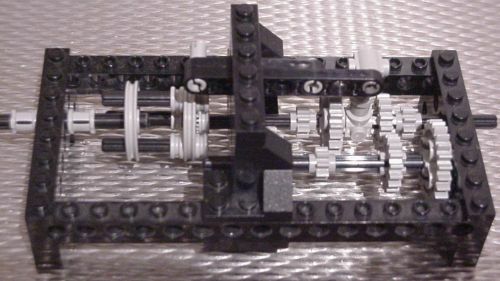 In this page, two pictures are shown to demonstrate the working of a simple gear box (made by my son, now15 ) that can be used to manually switch between 3 different forward transmissions and a reverse transmission. The driver is supposed to sit above the coupling and to pull or push the handle horizontally. 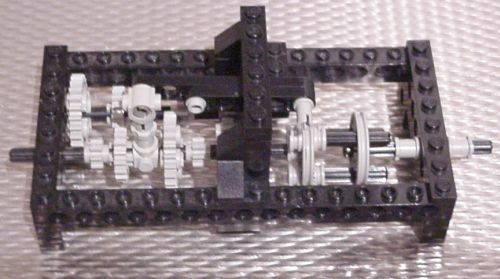 This gearbox is a reproduction of the gearbox that I had implemented a long time ago in the quad-quad, or 4-wheel-drive elsewhere on this site.